Have you heard? It’s all the hype these days! Just the other day, this tool of our trade was featured on the CoolTools blog over at kk.org. If you follow the link, you’ll find a well written summary of the tool, as well as some interesting follow up comments. 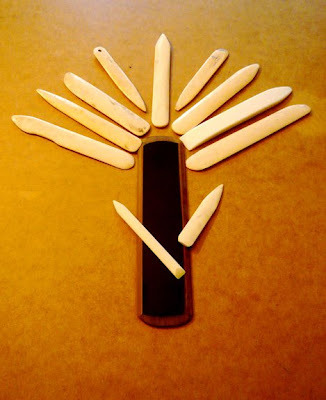 There are all sorts of tools that can be used for folding, but I'll just share a bit about the folders in my arsenal. The four above are my favorites. The two largest are my go-to folders that I use nearly every day. The smaller two are great for detail work and are the ones that I pack along in the car whenever I go on a road trip or vacation. They're a great size for tucking into a little travel kit for whatever small project I bring along. This is an interesting folder that deserves to be mentioned. It is made out of Bakelite and beveled on all four sides. The short ends have a nice curve, somewhat similar to the curve on my favorite bone folder. The sides are perfect for working on a large project, especially when it comes to box making. The Bakelite folder can be swept under a piece of rapidly drying bookcloth and used to smooth it onto a box wall in one swift motion. If you're in the Boston area you can pick one of these up from Sam at Harcourt Bindery, or you can get info on ordering one on their website. Folders found in arts and crafts stores generally come in just a few shapes and sizes, but the beauty of the natural material is that it can easily be altered. I had access to a Tormek grinding wheel which can speedily shape a bone folder to suite a specific need. Don't have a grinding wheel? Sandpaper will do, it will just take longer. 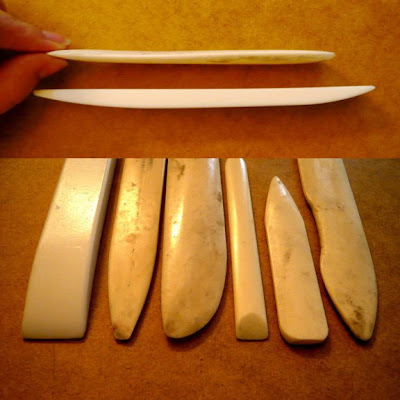 If you're looking for something beautifully ergonomic from the get-go, check out these Elk and Moose bone folders made by Jim Croft, or take it a step further and take a lesson (link) from him. The bone folder to the right was shaped on a Tormek at the suggestion of my instructor, Mark Andersson. This is a shape that he prefers, and I readily adopted his preference. It assumed its rightful position as my favorite tool as soon as it was finished. 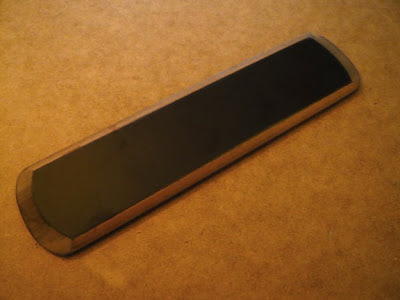 The rounded edge on the top is beveled to a nice sliver that is perfect for scoring and folding. The usual thickness of a store bought folder makes for a bulky score. Have you noticed the darker color on the beveled side of the bone? While some recommend soaking in olive or mineral oil, Mark taught me to keep it personal, and use a bit of the oil from my forehead to keep it fine tuned. Below is a short movie of the two most common ways I use my favored tool to fold paper. 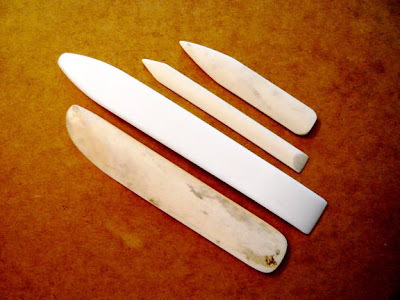 The notch in this bone folder to the left is instrumental for use on the spines of books. I pick this folder up when I'm securing spine linings on a flatback or rounded spine book. I love my Teflon folder, but believe it or not, I never use it as a folder, it's more of a smoother. I love how it is completely flat on one side and that it promises to never leave a burnish mark on any of my papers or cloth. While my personal Teflon doesn't make a nice score, these come in all shapes and sizes for many uses, especially for conservation. This (along with the Bakelite folder) is a great option for vegan binders, or those that may be squeamish about using bone. 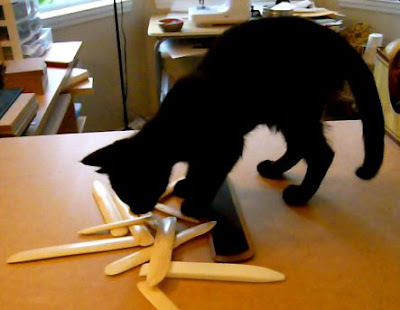 On a final note, the bone folder is also known as a fun toy to some (Ollie), and as a great E-Journal to others in the book arts community. Thanks for sharing all your folding tools with us! I loved to read this article - with such nice pictures of the folders. Thanks for opening your drawers for us! Oh where would we be without our favourite tools!? Thanks everyone, for your kind comments! thank you so much for the info! lovely cat too!